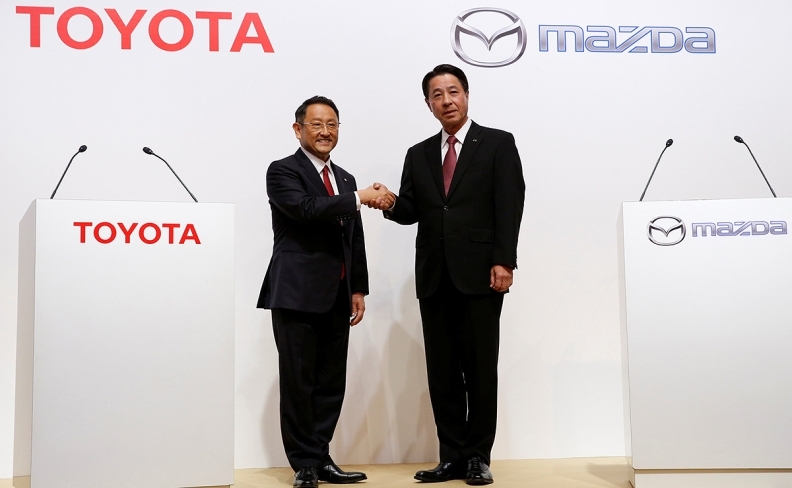 Toyota President Akio Toyoda and Mazda President Masamichi Kogai shake hands at a joint news conference in Tokyo to announce the plant in August. Alabama and North Carolina are reported to be the last remaining candidates in the running to land a prized $1.6 billion Toyota-Mazda plant, presenting stark differences spanning from production costs to talent availability. The finalists were confirmed by people familiar with the negotiations, Bloomberg reported last week. The Japanese automakers announced plans for the joint plant in August, which stems from an agreement in which Toyota Motor Corp. and Mazda Motor Corp. will take stakes in one another. One of the key distinctions between both states lies in history. Alabama, by nature, serves as a production hub for the automotive industry -- hosting manufacturing plants for Honda Motor Co., Hyundai Motor Co. and Mercedes-Benz, and an engine assembly plant for Toyota. The state is also home to more than 150 Tier 1 and Tier 2 suppliers, according to data compiled by Economic Development Partnership of Alabama. "From a production cost point of view, the advantage would go to Alabama," Gregg Wassmansdorf, site-selection consultant and senior managing director of Newmark Knight Frank told Automotive News. "The other advantage that they would likely have, just based on historical precedent, is their ability to provide economic incentive. They have historically been very aggressive when it comes to incentives for automotive." Wassmansdorf, whose team recently analyzed automotive assembly costs across Canada, the U.S. and Mexico, ranks Alabama in the top four of all jurisdictions across North America for their history of providing incentives for the automotive industry. Because manufacturing margins are slim, Wassmansdorf said the site-selection team will try to optimize "every piece of infrastructure, and every bit of the labor pool and the labor cost environment and the incentive piece." On the other hand, Alabama's saturated auto market may present a talent competition challenge, according to Wassmansdorf, producing a unique advantage for North Carolina, where the plant could be the sole player. "This plant would have to find some new sweet spot in the state of Alabama that they feel comfortable is not going to be competing for all the other talent that's already dedicated to OEMs, or the supplier network," said Wassmansdorf. Sites in Lawrence and Limestone counties were on a list of sites that could meet conditions, Alabama officials including Tom Hill, president of the Limestone County Economic Development Association, confirmed with the Times Daily. Hill and state Commerce Secretary Greg Canfield declined to comment on the project to Automotive News. Gov. Kay Ivey told AL.com in September that the state would be "proud" to have the project come to Alabama. "We'll be welcoming any automotive producer that wants to locate here," said Ivey. "I think they demonstrated in the past that they do have the ability to recruit OEMs like this project," Bob Rolfe , Tennessee Department of Economic and Community Development commissioner, told Automotive News. "I would see no reason why they would not be a good candidate for consideration," he said. North Carolina, one of the few Southeast states that hasn't landed a light vehicle plant (Daimler has two truck plants in the state), had prioritized the development of four auto plant sites: the Kingsboro CSX Select Site, the Chatham-Siler City Advanced Manufacturing Site, the Moncure Megasite and the Greensboro/Randolph Megasite. To sweeten the appeal of the Greensboro-Randolph site, southeast of Greensboro, the Randolph County planning board approved rezoning 370 acres around the site last week, the Triad Business Journal reported, boosting the size of the plot to 1,900 acres. "The Randolph site was the bridesmaid to a number of advanced manufacturing projects over the years, it was looked at by Airbus, it was looked at by Volvo and Mercedes," said John Boyd, a site-selection consultant and principal at The Boyd Co. in Princeton, N.J., told Automotive News. "This could be the project that it really, really has been working hard to attract." Jim Crawford, chairman of the Chatham County Commission, told WRAL-TV that Chatham-Siler City and Moncure were later nixed from the list of potential sites for the plant. Boyd gives a slight edge to North Carolina because of several factors -- one being that it holds a larger congressional delegation than Alabama. "This new joint manufacturing facility will be producing some very sophisticated, highly regulated electronic vehicles," Boyd told Automotive News. "There will be a myriad of legislative priorities and lobbying efforts, so clout in Washington, D.C., I think, is a site-selection driver." Another advantage North Carolina has, Boyd adds, is that only 3 percent of the state's labor force is unionized. "We call economic development in 2017, the second war between the states," said Boyd. "It's very, very competitive and companies like Toyota and Mazda are looking at a number of drivers ranging from operating costs, to skill sets, to labor markets, to transportation issues -- down to factors like clout in Washington D.C. ….and the intricacies of the labor market, i.e. the presence of labor unions." North Carolina has the second-lowest union membership rate among all 50 states, compared to Alabama, where 8.1 percent of the workforce is unionized, ranking it 28th in the nation, according to the Bureau of Labor Statistics. All four sites in North Carolina were pitched to the automakers, and residents close to the Greensboro-Randolph site, in particular, have witnessed increased levels of activity, the Triad Business Journal reported. "It's a very attractive site," said Boyd. "It's currently expanding which is an indicator of interest among a major trophy employer, and there's been reports of helicopters flying over the site and recently, a chartered Mercedes van full of executives was seen touring the site -- these are indicators of late stage field visits by senior company executives." Mazda spokesman Jeremy Barnes declined to comment on the project and Toyota did not respond to a request for comment.